Front row, from left, Inonge Kaloustian ’21, Maxwell Reading ’22, Rachel Still ’20, Emily Abbott ’21, Biko Gayman ’21, and Jordan Blocher ’21. Back row, from left, Alex Nazaire ’22, Antonio Lapeyrolerie ’22, Matthew O’Hara ’21, Joseph Diaz ’21, and Kate Jensen ’19. In March, about 150 Massachusetts judges will come to Clark to attend a conference on race and ethic fairness in the district court system. As part of that event, they’ll view a training video on bias in jury selection — a film that features current Clark students. 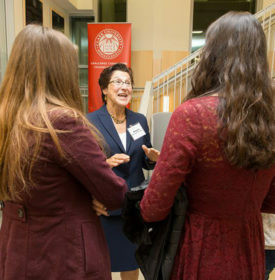 Judge Margaret Guzman ’89 speaks with students at a 2016 ClarkCONNECT event. Mark Miller, professor of political science and director of Clark’s Law and Society program, recruited the students on behalf of Massachusetts District Court Judge Margaret Guzman ’89, the organizer of the second all-court Judicial Conference on Race and Ethnic Fairness, to be held on campus March 22. 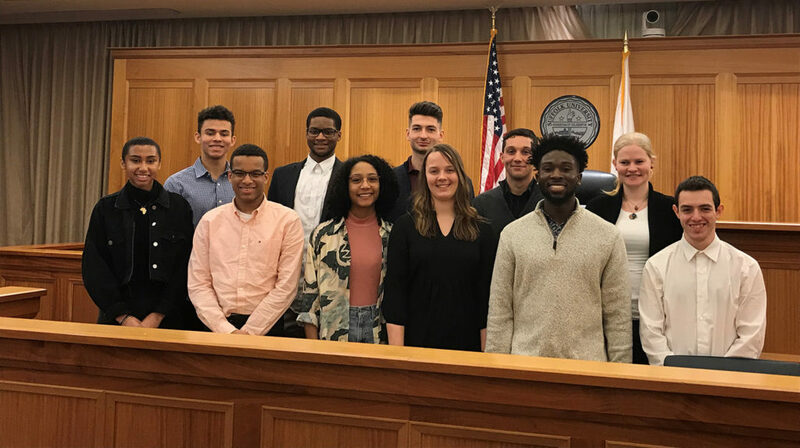 The students involved in the filming include members of Epstein Pre-Law Society as well as the Mock Trial, men’s basketball, and women’s soccer teams. They traveled to Suffolk University Law School on Jan. 31 to participate, where they met with Chief Judge of the District Court Paul Dawley.